Mark Gardiner, an Angus breeder from Ashland, Kan., talked about his community's experience with the largest wildfire in Kansas history last spring. Sell more beef. Sell more beef. 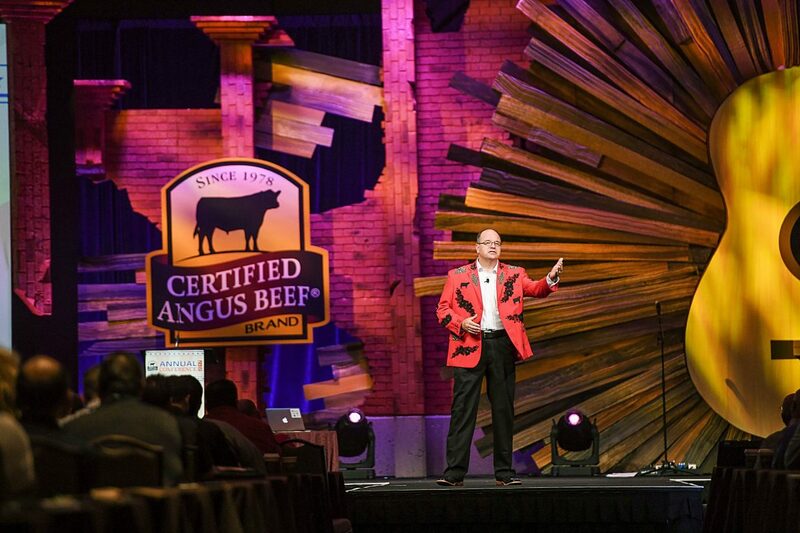 It wasn't a chant, a published focus or even a hashtag, but it was the underlying theme of the conference that brought more than 600 stakeholders from all parts of the beef community together in Nashville, Tenn., last month. 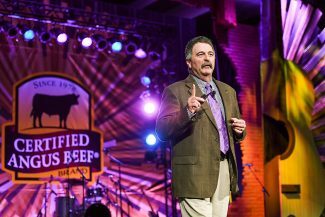 "We want you to feel challenged," said John Stika, Certified Angus Beef brand president during the company's annual conference. Taking the stage in a Porter Wagoner-inspired sport coat in Music City, he was dressed for the challenge: "We want you to feel pushed to extend yourself, or at least your thought process, outside the limits of your traditional comfort zones." The rest of the program continued to drive that point. "You just had a great 12 months, but we have to stay agile and hungry," said futurist Anders Sorman-Nilsson. He gave attendees a look at how technology will change life in the future, and how ignoring change today could make your business extinct very soon. "Claiming that your business is customer centric will be impossible unless you're data centric," he said. But it's understanding how to use those numbers to influence individuals. "We have to connect with digital minds and analog hearts." One avenue? Tell compelling stories, said former Under Armour vice president Steve Battista. "Your story is your most important product," he said. "A brand has a language. It has code. It has principles. It pulls you into its family." CAB shared successes among its family of partners from retailers and chefs to processers, packers and producers. 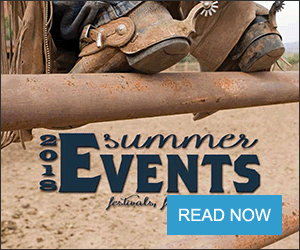 Five awards honored cattlemen and women for their commitment to quality and fostering connections throughout the chain. Two-minute videos of each played on the big screen, as their cohorts along the beef chain got to know them and the Angus breeders on the CAB board during breaks and meals. Mark Gardiner, Angus breeder from Ashland, Kan., delivered a heart-wrenching talk about his community's experience with the largest wildfire in Kansas history last spring. "It's not emotion about the stuff that was lost — it's emotion about what God's people did for us," he said. "It's the greatest blessing in my life." In a community where 85 percent of the income is generated from cattle, it's a significant impact when 500,000 acres and 30 homes burn. An estimated 10,000 cattle perished. "The next morning people kept coming and coming," Gardiner said. "You see all of these people bringing their precious resources. Lots of the Dakotas came and they were having a major drought. It was spring break in Kansas, and kids came and rolled up wire. They worked for days on end." The Angus family goes beyond blood, Gardiner said, inspired by his late father to add, "We can do this, so let's get to doing it. We have the greatest opportunity in our history to make things better," he said. 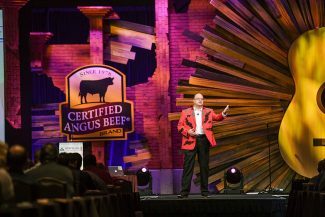 That forward-facing outlook carried into retail and foodservice breakout sessions on everything from ideas on beef aging to ways better ways to lead teams. "Most of your life is rowing. If you don't learn to be good at it and enjoy it, you're going to have an unhappy life," said John Izzo, leadership coach and author. It will take that kind of work to continue to keep beef on the center of the plate, said CattleFax president Randy Blach. 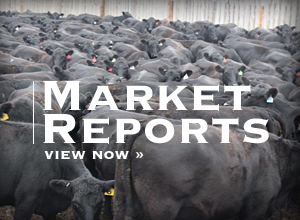 "It's pretty incredible to grow supply that much and keep an upward trend in value," the analyst said, noting CAB grew tonnage by 10.4 percent this fiscal year, but market signals remained strong. "Consumers want quality and they're willing to pay for it." Competing proteins are building supply at a rate of 3 percent each quarter, so high-quality beef growth will rely on new marketing ideas and products. At the "Taste Drive," 21 processors served 120 different value-added offerings. Options included long-time favorites like pre-pattied burgers and pre-cooked brisket, alongside innovations such as a beeftisserie — a tri-tip roast for a hot deli offering that would rival a rotisserie chicken — and Schmaco (beef bacon). "We're all going to have an opportunity to get better, to improve, to become more knowledgeable about this brand, and have an opportunity to more fully understand and appreciate how we all fit together in this effort to produce high-quality beef," Stika said. More than 120 had participated in the pre-conference tour of nearby Deer Valley Farms, where they walked the fencelines next to the newest crop of bulls and saw a minutes-old calf take its very first steps. "This is what we do every day and every night," general manager Jonathan Perry said. "If you guys don't utilize and push and sell our product, we don't have a livelihood, so we thank you." Appreciation back to the end-users was a theme. Current Colvin Scholarship winners spoke during the closing banquet, sharing career goals and saying thank you. 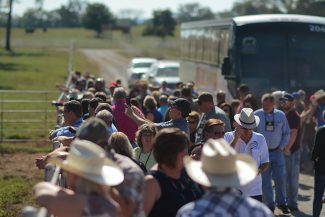 Then attendees raised a record $125,120 for future ag scholarships. The independent meat companies pooled resources to donate $65,000 to the Ashland Community Fund's wildfire relief efforts, while Del Monte Meats purchased a sketch of a pair that calved the morning after the fire to add another $20,000 to the fund. The conference focused on those connections all across the beef chain, and how that fulfills the greater mission, Sitka said. "We aspire as a brand to make life more enjoyable," he said. "And in doing so, create a meaningful value that ultimately allows us to support farmers and ranchers who provide for the families and their communities that they live in."